At first, it may seem ludicrous to even contemplate the use of legal measures as pest control strategies -- it's easy enough to pass laws, but how do you train the insects to obey them? In reality, legal sanctions are aimed, not at the insects themselves, but at a range of human behaviors that are most likely to affect the dynamics of pest populations. Legal control tactics, therefore, include all forms of legislation and regulation that might prevent establishment or reduce spread of an insect population. The Plant Quarantine Act of 1912 was the first legal action taken in the United States to prevent the introduction of pests from foreign countries. This law, and others that followed it, established a network of inspection stations at major ports of entry and gave the federal government authority to organize border quarantines, to inspect all agricultural products, and to restrict entry of any infested goods. Today, these inspections stations operate under the jurisdiction of the Animal and Plant Health Inspection Service (APHIS), a branch of the U. S. Department of Agriculture. APHIS operates about 85 inspection facilities, employs 400-500 inspectors, and intercepts over 20,000 potential pest introductions in an average year. It also operates the Plant Quarantine Training Center where inspectors from all over the world are trained to spot problems before they cross international borders. These agents, now representing nearly 40 countries, cooperate in efforts to limit the spread of indigenous pests under an international agreement that requires inspection and certification of nearly all agricultural commodities prior to export. Federal import/export laws have been enacted to establish standards for a wide range of agricultural products. Most of the fruits and vegetables imported to the U.S., for example, must receive some form of fumigation, heat treatment, controlled atmosphere storage, or radiation exposure before they are released from quarantine. These post-harvest treatments are designed to kill whatever pest species may be present without affecting taste or quality of the produce. Despite the best efforts of APHIS inspectors, some pests still slip into the U. S. and become established (e.g., cereal leaf beetle), or move naturally across international borders (e.g., imported fire ants and Africanized honey bees). When this happens, APHIS cooperates with state and local governments to establish domestic quarantines for limiting the movement of these pests within our borders. 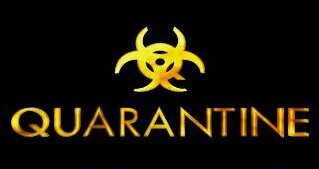 Whenever appropriate, eradication programs may be launched together with quarantine actions in an effort to destroy the entire pest population while it is still small. Inspections and quarantines are also operated by some state and local government agencies. The California Border Patrol, for example, is notorious for its interceptions of uncertified agricultural products at the state line. The rigid laws that prohibit private citizens from bringing a bag of oranges into southern California are generally given credit for excluding numerous pest species that might have caused millions of dollars in losses. The price tag for these prevention efforts is only a fraction of the estimated $350 million Californians spent to clean up their most recent infestation of the Mediterranean fruit fly (Ceratitis capitata). Since 1915, nearly 300 pest species have been under some sort of domestic quarantine (see Table 1). The success of these programs has been erratic. In some cases (e.g., screwworm flies, khapra beetles, and parletoria date scale), eradication programs have managed to eliminate the pests. But for every noteworthy success, there has been a complete failure (witness the cereal leaf beetle, the gypsy moth, and the European corn borer). In general, eradication efforts are most successful when the pest population is relatively small, does not disperse rapidly, and is highly susceptible to control tactics. Even if a newly established pest population cannot be eradicated, it can often be slowed down a bit by regulating the movement of its host plants or animals, prohibiting sales of infested products, and inspecting all shipments of affected goods. This type of containment strategy usually gives growers and producers a short reprieve before invasion of the pest and buys a little more time for researchers to find better methods of control. By using the containment approach in Texas during a 1971 outbreak of Venezuelan equine encephalitis, entomologists and veterinarians had enough time to reduce populations of mosquito vectors and immunize nearly 3 million horses before the disease could spread into other states. Licensing and certification are important regulatory tools used in some commodities to ensure that infested or contaminated material is not sold commercially or used as breeding stock. Maintaining disease-free mother plants in strawberries, for example, can often prevent the spread of insect-borne disease during the growing season. Certified seed or plant material is produced under strict guidelines established by commodity organizations in their own interests. These products may be more expensive initially, but eventual savings in pest control usually provide a good return on the investment.